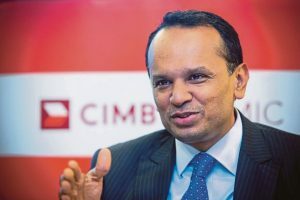 KUALA LUMPUR, Sept 27 — CIMB Group Holdings Bhd and its collaborators aim to capture 5 to 10 per cent in trade financing from the China halal market, which is forecast to be worth US$2 trillion (RM8.3 trillion) by 2021. CIMB Islamic Bank Bhd Chief Executive Officer (CEO) Rafe Haneef said the target would be driven by the CIMB Asean-China Halal Corridor initiative, an enhanced trade network linking halal businesses across China and the region emphasising on the agribusiness, cosmetics, food and beverages, modest fashion and pharmaceuticals sectors. “The CIMB Asean-China Corridor also aims to leverage on the growing trade flow along the existing halal corridor, particularly as China’s halal sector is expected to reach US$2 trillion by 2021, with a potential customer base of 266 million in Asean and China,” he told reporters at the launch of the initiative here today. CIMB Asean-China Halal Corridor was launched by International Trade and Industry Minister Darell Leiking and witnessed by CIMB Group CEO Tengku Datuk Seri Zafrul Aziz. Darell said the initiative was timely, with the global halal market valued at US$6.4 trillion and estimated to grow at a compound annual growth rate of 7.3 per cent in the next five years. The Malaysian Islamic Development Department (Jakim) halal certification system — recognised in 42 countries including Australia, China, France, Germany, Indonesia, India, Japan, the Philippines, Singapore, Thailand, the US and the UK — is a significant component in forging partnerships with several Chinese banks for involvement in this initiative. “With strong industry players (participating) such as Jakim, Halal Industry Development Corporation, Serunai, MasKargo, Iskandar Halal Hub and three Chinese banks, I am confident that the initiative, as the pioneer halal trade ecosystem, will be a great success,” said Darell. The three enabling Chinese banks are Bank of Communication Co Ltd, China Merchants Co Ltd and Bank of Nanjing Co Ltd.
Malaysia is the leading global halal hub and Islamic economic generator and has been the leader in the Global Islamic Economic Indicator for five consecutive years, reflecting the country’s robust Islamic economy ecosystem.